Elude party goers the whole night until the big reveal in our Volto Arcobaleno Strass - Fancy Full Face Venetian Masks. This oval Volto Venetian mask is handmade by Italian artists who utilize centuries-old mask making techniques. Using traditional colors of Mardi Gras, our Volto Venetian masks feature royal blue, regal purple, gleaming gold and brilliant green. Decorative scrolls are painted on the surface, and clear crystals line the eyes emphasizing your natural beauty. 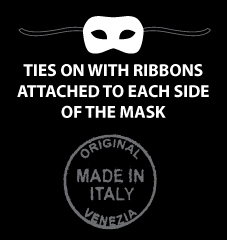 To create a snug fit, our mask makers add silky ribbons at the temples of our masquerade masks for easy tying. 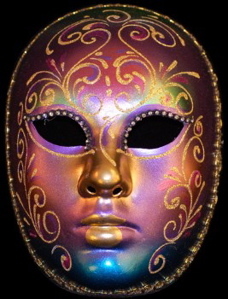 Display this mask as an art piece in your home, or stun onlookers at Mardi Gras or a masquerade ball. Create your own unique masquerade costume by adding a black, purple, or blue hooded cloak made by Venetian Mask Society.